Amaircare 7500 Cart Airwash heavy duty portable air purifier features filtration for a wide variety of industrial applications: property rooms & evidence rooms, construction & renovation, fire & mold remediation, marijuana dispensaries, welding and print shops, among many others. Best used where VOCs are a concern. Coverage for 60,000 ft3 (provides 1 ACH/hr). The steel tube cart and heavy duty tires allow for easy transportation even in rugged environments. Comes with a 5 YEAR Limited Warranty. Amaircare 7500 Cart Airwash Air Scrubber is a heavy duty portable VOC air purifier featuring filtration for a wide variety of industrial applications: evidence rooms and property rooms, construction & renovation, fire & mold remediation, marijuana dispensaries, welding and print shops, among many others. Special carbon blend is designed specifically for The electrolyte can release thionyl chloride, hydrogen chloride, hydrogen fluoride, sulfur dioxide, and toxic organics, and there can also be a release of metal particulate. Best used where VOCs,odor, gas, virus and bacteria area concern over particulate matter. Featuring perfect seal technology. Coverage for 60,000 ft3 (provides 1 ACH/hr). The steel tube cart and heavy duty tires allow for easy transportation even in rugged environments. Amaircare air cleaners (airwash, air scrubbers, chem bio airwash) are individually tested to meet HEPA standards and beyond. This means that the complete air cleaner system will remove at least 99.97% of all particles as small as 0.3 microns (1/300th the size of a human hair or 0.000012 of an inch) that enter the air cleaner and are also 95% efficient at 0.1 microns. 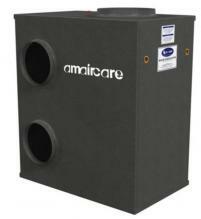 The 7500 is built to provide air filtration for large commercial spaces. Comes with a 5 YEAR Limited Warranty. Also known as AirWash. Filter section is easy to access for maintenance. Protective steel mesh safely covers the air outflow. Also available in 220 and most plug types. Second stage Carbon only canister available for special applications. Top Filter Access Panel and Intake with Handle – Panel slides and lifts without difficulty to access filters for maintenance. Metal Mesh Prefilter on Intake – provides heavy duty large particulate filtering and protects the interior filters, extending ultrafine and VOC filtering performance. 2” Fresh Air Intake Port – allows for new external air to be filtered and introduced to the environment. Can be used to create a positively pressurized “safe-room” environment. Right Side Directed Outflow – direct and redirect clean air as needed with the versatility of front swivel castors. Sturdy Steel Tube Cart with Rugged Tires and Castors – navigate uneven terrain to bring clean air anywhere your work requires. Steel Construction with Baked Thermoset Powder Finish – tough wear and tear resistant housing that doesn’t off-gas chemicals, true to the integrity of providing clean air! Interior Filters – final 3 stages of filtration is contained and protected within a durable steel cabinet. Perfect Seal Filter Configuration – Easy-Twist HEPA locks into place to ensure the filter is completely sealed in the unit and no polluted air leaks. Dual Perfect Seal 3 Stage Filtration – two sets of filters capture large particulate and VOCs with the first stage foam prefilter, harmful and irritating particulate are trapped with the second stage HEPA filter that locks in place and chemical/gas pollution are adsorbed by the third stage carbon VOC filter. Easy-Twist HEPA Cartridge – Filters are convenient to access and change with just a twist of the main HEPA Cartridge. Standard Third Stage VOC Canister – 2 x 1550 g of granulated carbon provide vital capture of chemical and gas pollution. Variable Speed Control – change the system rate of air flow to suit capture needs to the level of contaminants in the environment. Detachable 12’ IEC Power Cord – conveniently removes for portability and storage. Two High Efficiency AC Backward Curved Motors – for boosted dual performance air flow at a low running cost, minimal drain on electricity resources with years of continuous performance. Ultra VOC Filter Upgrade – replaces the HEPA Cartridge with a 9475 g canister of granulated carbon for cases requiring extreme chemical and gas pollution capture. Replace one or two HEPA Cartridges. Customized treated Carbon fills available upon request. Collared Intake Panel – allows for rigid or flexible ducting connection to configure targeted source capture of pollutants. *available in most commercial voltages with standard plugs. 7500 air wash can be custom designed to solve numerous air purification needs and is frequently referred to as an air scrubber, air wash, Chem Bio Airwash, Heavy Duty or Commercial air purifier. 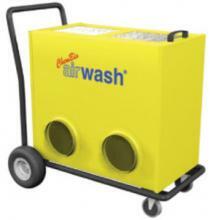 Download Amaircare 6000V and 7500 Airwash Cart Brochure by clicking here. Download Amaircare 6000 and 7500 Safe Room Brochure by clicking here. Download Amaircare 6000V and 7500 Airwash Uses by clicking here. Download Amaircare 7500 Maintenance by clicking here. 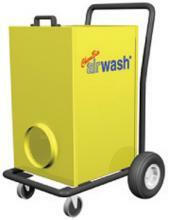 Download Amaircare 7500 Airwash Spec Sheet by clicking here. Download Amaircare 7500 Dual Return Setup by clicking here. *Note: Straight activated charcoal does not have much capacity for some reactive gases, such as ammonia, formaldehyde, etc. In some cases where the gas is chemically reactive, appropriate impregnated activated charcoal can be recommended. There may be an extra charge for this. Please contact us, if you are in need of filtration of a specific chemical(s) and would like more details. 5.0 Small and Mighty 11/04/2016 By Mary We had a very special case for this unit, and it delivered! During an abusive battery test our built in vent system had a malfunction. This cart picked up the slack and then some, clearing the test bunker and surrounding room in minutes. When I went to change the filters after the event I was expecting a disaster, but they did their job and I didn't have much extra to clean inside. Very impressed! A huge thank you to Barb who coordinated with the manufacturer to customize this unit for us... you rock!